Not so many years ago it was commonly argued that Scots could not really learn about their history because 'there are no books'. It was an absurdly untrue statement even then, and it is certainly untrue now. General histories, in single volumes or in multi-volume series, of scholarly quality, are now readily available and widely-studied. 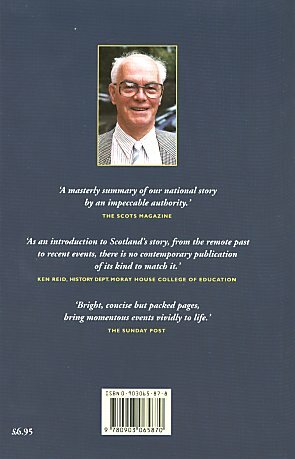 Studies of particular themes and topics, and edited collections of documents, are becoming available in such variety as to encourage the serious study of virtually all aspects of our history; and the Scottish universities have been fortunate in recent years to have the services of distinguished and influential historians working in the field of Scottish history, once the poor stepbairn of History departments. These scholarly activities have stimulated many humbler works whose aim is to bring some knowledge of Scottish history to pupils and students at school or college, and to such members - and there are many - of the general public, who are awakening to an interest in Scotland's story. Why then this book? It does not, and cannot, offer an exhaustive coverage of Scotland's history, nor would I have the impertinence to attempt such a task. I have tried to offer, to the general reader, not another narrative, but rather an explanation. I have concentrated upon what I believe to be the factors and the influences, the events and developments, the opinions and the decisions, which have caused Scots to undergo that set of experiences which we call our history. James Halliday was born in Wemyss Bay in 1927. After attending the village school at Skelmorlie and Greenock High School, he graduated in history at Glasgow University, being awarded the Medley and Lanfine Prizes during his course. He taught in Further Education at Ardeer and in High Schools in Coatbridge and Uddingston, before going to Dunfermline High School in 1958. There he was appointed Principal Teacher of History, leaving in 1967 to join the History Department of Dundee College of Education. In 1979 he became head of that department until retiring in 1988. He was awarded the M. Litt. degree from Glasgow University in 1963 for his study of the issues and personalities of the Revolution in Scotland during the years 1688-90. He has served at various times on the council of the Scottish History Society, the Scottish Records Association and the Scottish Association of Teachers of History, and has written extensively on history and the teaching of the subject.